A reminder that like all UBC Library branches, Rare Books and Special Collections, University Archives and the Chung Collection will be closed in lieu of Canada Day on Monday July 2. We will resume normal hours on Tuesday July 3. The photograph above is attributed to Phillip Timms and probably was taken near the turn of the 20th century. According to the inscription, this photograph was taken at the Dominion Day Parade at the corner of Georgia and Burrard. 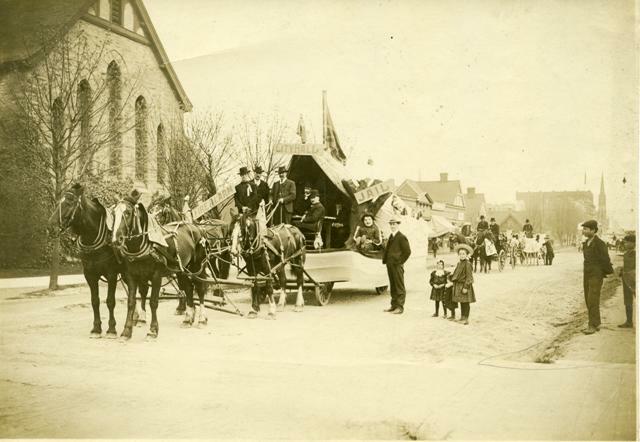 The parade float is likely a reference to the famous Vancouver City Hall tent, erected and photographed after the great fire of 1886 (see it at the City of Vancouver Archives here). This photograph is from our B.C. Historical Photograph Collection. For more information on searching and using photographs, please see our Historical Photographs Research Guide. When searching for historic Canada Day celebrations, remember to also search for “Dominion Day-” the name of the holiday was not changed until 1982- see Canada Day Background from Canadian Heritage. I am headed off this week to the Association of Canadian Archivists conference in Whitehorse, so it seemed appropriate to feature the Yukon Room in our ongoing blog series on places used as room names in the Irving K. Barber Learning Centre. The theme of the conference is “In Search for Archival Gold,” and archivists from across the country will be there to discuss how to acquire, appraise, preserve and provide access to the “gold” in our collections. Aside from rooms named after people or events, the Yukon room is the only room in the Barber Centre that is not named after a B.C. place. Coincidentally, although Rare Books and Special Collections focuses primarily on the history of British Columbia, to a certain extent our collections policy does include the Yukon and the Arctic (you can read our full collection policy online here). The photographer’s inscription reads, “B.L. and K.N. Co.’s str. “Flora” loading wood on Yukon River, June 7, 1900,” meaning “Bennett Lake and Klondike Navigation Company Steamer.” The photographer, H.J. Goetzman, according to Camera Workers of B.C. was active in the Dawson area from ca. 1897, and then moved on to San Fransisco in 1904, putting him in the Yukon for the Klondike Gold Rush. Goeztman was obviously a frequent passenger on the Flora– as you can see in the photo, the lifeboat is declared as “Reserved as a stateroom for Goeztman, Dawson Photographer”! 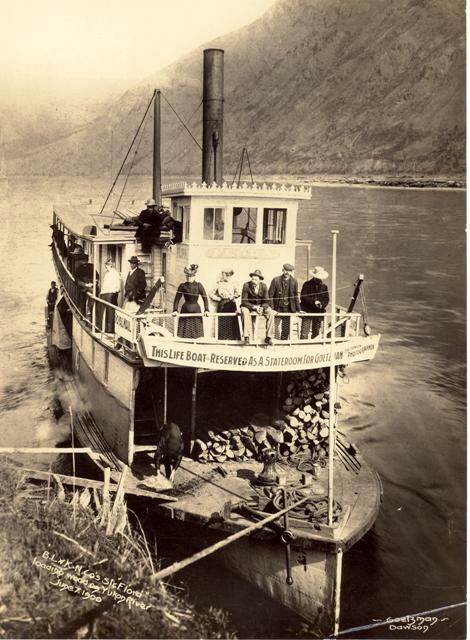 Supposing you wanted to do some research about the Flora– if you search online, you will find that Wikipedia lists it in an article about Steamships of the Yukon River. But since the information about the Flora is not cited specifically, it is difficult to know whether you can trust that information. To research ships, we often point researchers to either the Vancouver Maritime Museum Library and Archives, where they have access to Lloyd’s Register of Ships. You could use the information in the Wikipedia article as your starting point, but confirm it (and maybe dig a little deeper) using primary sources. This photograph is part of our general B.C. Historical Photograph Collection (kind of a misnomer since this photo isn’t from B.C.! ); you can read more about our photo collections in our Historical Photographs Research Guide. In the Barber Centre, the Yukon Room is number 181, a classroom on the first floor.